WARNING: If you are allergic to nuts, please refrain from reading this post. When I lived on the west end of Toronto, I ate many meals at Fresh. I was drawn to the healthier-orientation of their vegetarian menu BUT the real treat sat in a covered glass dish at the front counter – the flourless cashew cookies. At first glance you’ll think nothing of these caramel coloured baked goods, and you may want to keep it that way (what you don’t know can’t hurt you). Let’s put it this way. Once I had my first bite of these creamy, crumbly, melt in your mouth treats there was no turning back. 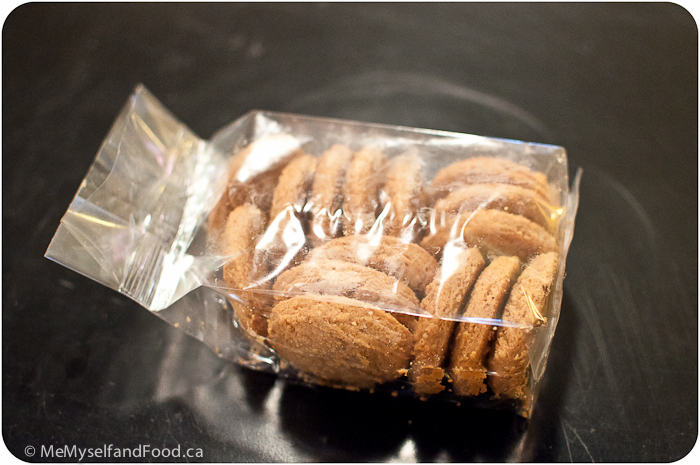 I physically could not walk out of Fresh without one or two cashew cookies tucked into a paper bag (after paying for them, of course). I now live in Leslieville and there are no Fresh Restaurants in sight. Since moving I’ve been suffering from cashew cookie withdrawal. Until this weekend, when I popped into the Wholesome Market health store in the Beaches to replenish my multi-vitamins and a sampling plate with that familiar caramel colour caught my eye. I picked up one of the remaining pieces and by the texture alone I knew it was my long-lost cashew cookie! I savoured the piece and grabbed another. My eyes scanned the store to make sure I was in the clear while scooping up a 3rd sample. It was time to remove myself from the table before things got ugly with the crumbs. I then noticed a pile of boxes just next to the tray. OMG…they sell boxes of cashew cookies! I was overjoyed as I ran to the cash (and almost forgot why I was there in the first place). I rushed through my dinner that night just so I could rip open that box. I was delighted to see 15 smaller sized cookies sitting inside. It would make it a little easier to control my temptations. Although, that night was an exception…I had two for old times sake. 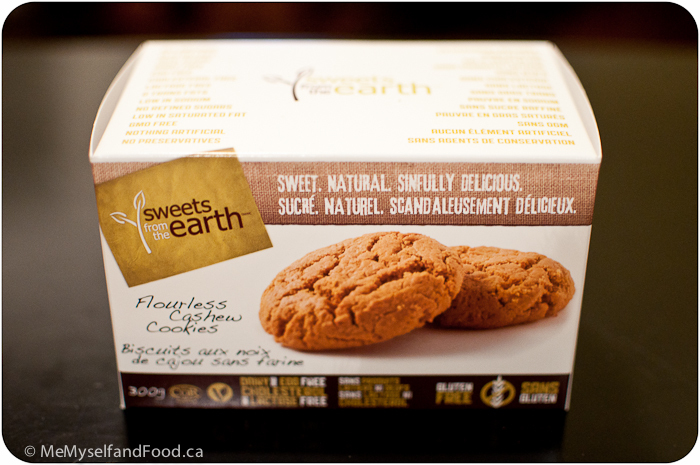 These cookies are made by Sweets from the Earth (and how sweet they are!). Thankfully they’re not THAT bad for you being made just a few ingredients: cashew butter (surprise), organic evaporated cane juice, organic tofu (an odd addition), baking soda, sea salt. They are also perfect for you folks with allergies to dairy, gluten and eggs. The $8 investment is also worthwhile in my mind (and this comes from someone who’s rather frugal). So go nuts (pun intended) and get yourself some flourless cashew cookies! !